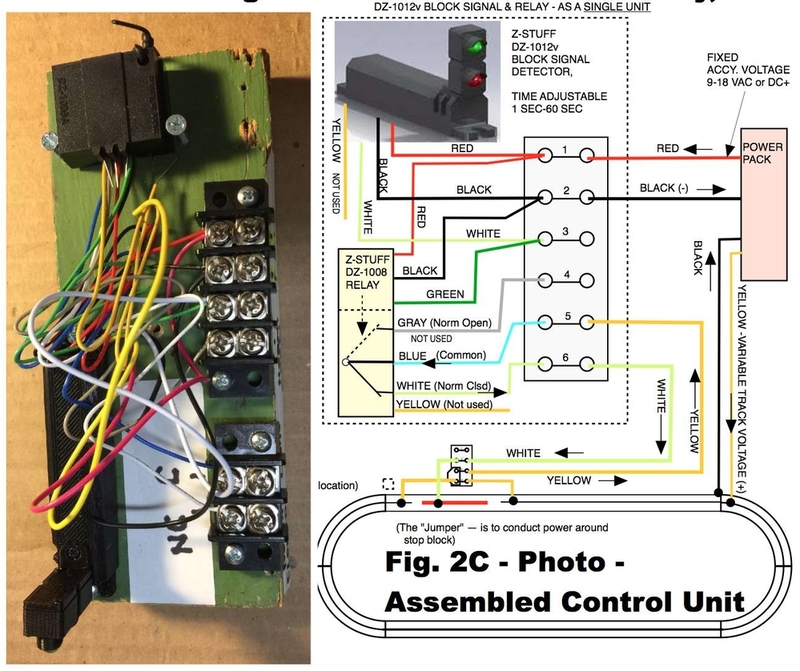 This new video shows a Z-Stuff Infrared Block Signal Detector and Relay AUTOMATICALLY controlling two 3-rail O-gauge trains on the same LIONEL O-27 track loop. 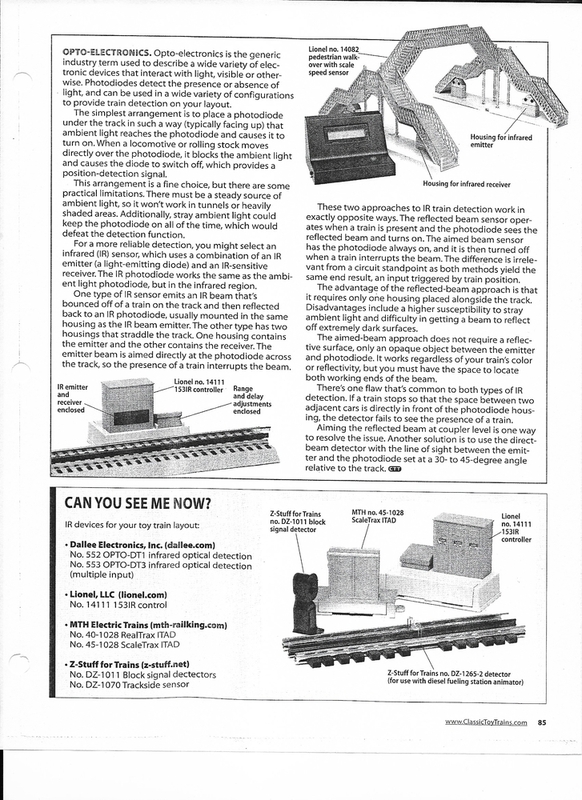 This is probably one of the SIMPLEST methods you can use to control two non-DCC trains on the same track. It just requires 1 "Stop Block" to be cut in the center rail (or either rail if using 2-rail track), and then placing the detector-relay combination at the end of the block. Part 1 shows a Z-Stuff DZ-1012v Infrared Block Signal Detector placed at the END of an isolated "Stop Block" in the center-rail. The Detector's time delay is used to cut off the power in the block -- which will STOP a following train that is following too closely behind a leading train that just passed through the block. Part 2 -- using the "Release From Rear" method -- shows a Z-Stuff DZ-1011 Infrared Block Signal Detector placed several train-lengths "UPSTREAM" of an isolated "Stop Block" in the center-rail. When the following train activates the Detector, the connected relay will START the leading train that is stopped in the Stop Block. Although a DZ-1011 Detector was used for this Part 2 demo, the newer DZ-1012v Detector is recommended. The "Delay From Front" method shown in Part 1 is the RECOMMENDED method. But in some cases this "Release From Rear" method may work better. Note this Part 2 "Release From Rear" method has a logic similar to the "Insulated Rail" method (discussed in an earlier Video #667, and described in the 8/2018 thread here: https://ogrforum.ogaugerr.com/...lays-nor-electronics . 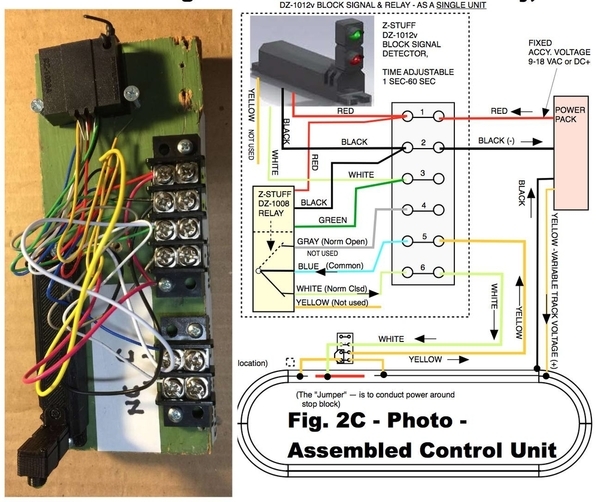 The below image shows a photo of detector-relay unit, and wiring diagram -- as used in "Part 1" of the video. Other drawings are on the web page that is linked above in Para. 2. I saw this on youtube yesterday or the day before. Pretty interesting use of the Z-Stuff controls. Others may have know this, but I had no idea they had anything like that or what they had could be used like this? 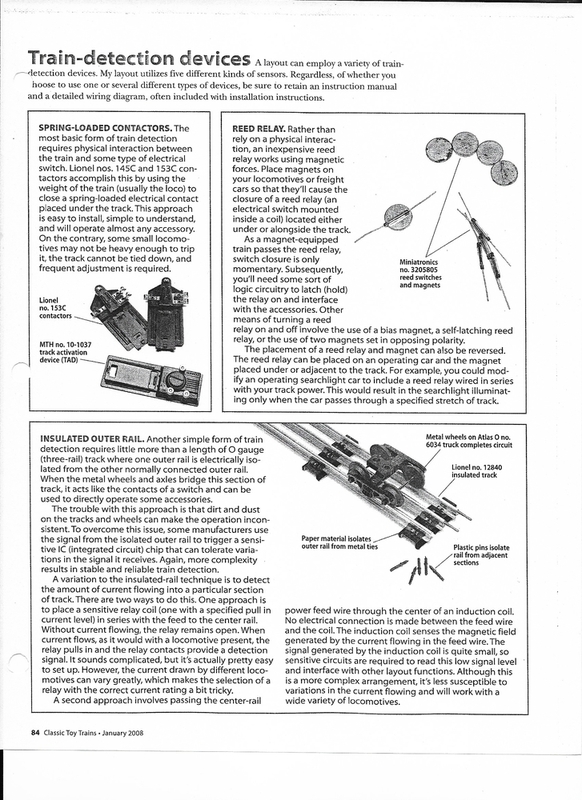 In the past, I recall seeing a few folks around here asking about controlling trains like this for displays and other things. This should be a good tutorial for them, it was for me! Thanks for posting! 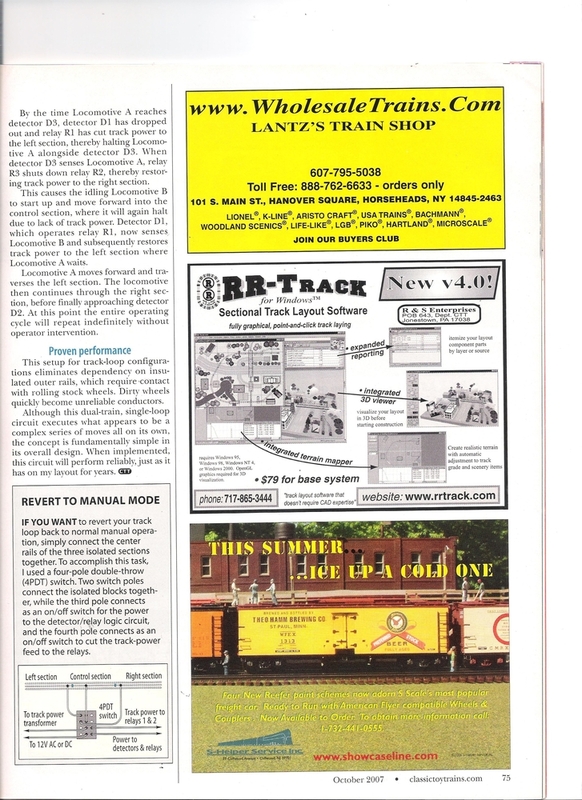 Z-Stuff IR detectors were used to accomplish two trains on the same loop in my October2007 article in CTT. The IR detectors sensed the train location and controlled the power to designated insulated blocks. 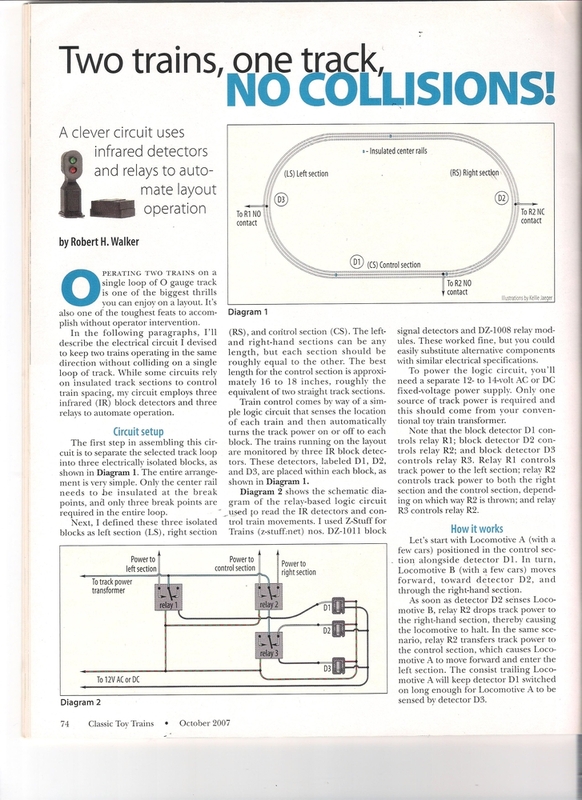 Thanks for posting a copy of that automatic control article. FYI: I have enjoyed reading some of your great CTT articles and viewing some of your videos, but that particular article I was not aware of it. In this video #668, we used just ONE detector, ONE relay, and ONE isolated "stop block". Also, we can run just ONE train (manual operation, when not running both trains) in the forward direction -- without having to add any electrical switches. In the system you show in the 2007 article, I think that system is more prototypical -- and also more "fail-safe" -- because I believe each train is protected by a block. It would be interesting to see a VIDEO of that system operating. With this DZ-1012 type of system shown in the video, you can sometimes run MORE than 2 trains -- IF you have a longer mainline, and IF the locos run somewhat similar speeds. In the 1992 videotape V92902-5D, I did a demo using the "APS Electric Eye" (which functioned similar to the DZ-1012. Like the DZ-1012, the APS Electric Eye had one normally-closed contact, one normally-open contact, and an adjustable time delay. The video shows FOUR LGB trains being separated, and operated by just 1 Automatic Block. There's an excerpt of that video shown in Part 2 of Video #668 at about the 18 minute point, which can be viewed with this link: https://youtu.be/LMSptSSnkcw?t=1102 . The complete video V92902-5D can be viewed at http://youtu.be/bvPwAuzoQaY . Just realized that the last two pages of my detection article were not included in my 11/13 post, so here they are.